Nashua Stoves - a heavy duty plate stove from the late 70's. One of their advertisements featured putting a stick of dynamite into the stove and setting it off - the stove and even the door latch survived! Keeping warm never looked so good. Nashua Fireplace Stoves -woodburners and coalburners- give you more for your money. Clean-line designs with the charm and beauty offered by large glass fireviewing areas are combined with exceptional radiant and powerful forced hot-air heating capabilities. Compare Nashua Fireplace Stoves for quality - the same fine craftsmanship, choice materials and careful attention to detail of every Nashua are evident in these models. 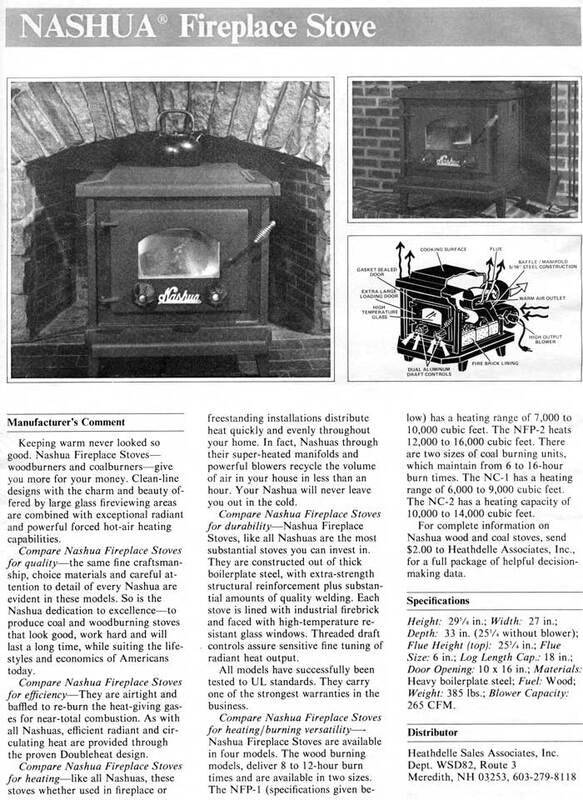 So is the Nashua dedication to excellence - to produce coal and woodburning stoves that look good, work hard and will last a long time, while suiting the lifestyles and economics of Americans today. Compare Nashua Fireplace Stoves for efficiency. Nashua Fireplace Stoves are available in four models. The wood burning models, deliver 8 to 12-hour burn times and are available in two sizes. The N FP- 1 (specifications given be- low) has a heating range of 7,000 to 10,000 cubic feet. The NFP-2 heats 12,000 to 16,000 cubic feet. There are two sizes of coal burning units, which maintain from 6 to 16-hour burn times. The NC-i has a heating range of 6,000 to 9,000 cubic feet. The NC-2 has a heating capacity of 10,000 to 14,000 cubic feet. For complete information on Nashua wood and coal stoves, send $2.00 to Heathdelle Associates, Inc., for a full package of helpful decision-making data.